After showcasing a range of mobility aids at the 2018 Occupational Therapy Show, including the UPnRIDE, Sunrise Q700 UP M and Paravan powerchairs, Precision Rehab has said that it received extremely positive feedback from OTs visiting the exhibition. Precision displayed the UPnRIDE and Sunrise Q700 UP M standing powered wheelchairs alongside the Paravan PR50, Paravan PR30 Evo II and the Paravan Piccolino, which features a low to floor seat height of 38cm with an option of 36cm. Matthew James, Co-Director at Precision Rehab, commented: “The OT Show has been great for us in the past, and this year’s event was no different. The UPnRIDE is the first powered wheelchair of its kind in the UK to offer auto balancing and unchanged centre of gravity to ensure the user has continuous stability, even when travelling up or down slopes. Additional feelings of stability and safety are provided by the jointed braces and harness straps. The Q700 UP M is a standing powerchair that allows the user to lie flat or stand due to its biomechanical standing seating system, which enables the user to stand at up to 85˚. With a narrow base of 620mm and a turning circle of just 1250mm, the Q700 UP M is highly manoeuvrable in confined spaces and easily fits under tables and into wheelchair accessible vehicles due to its low seat height of 445mm. Over the last three years, Precision Rehab has grown steadily. 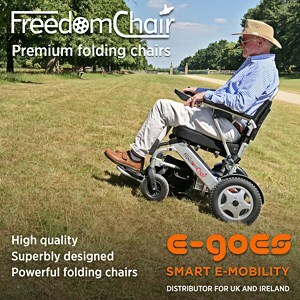 As part of this continued growth, the company announced that Motus Medical Limited will be its authorised distributor covering the Midlands and North of the UK for the range of Paravan and UPnRIDE specialist powered wheelchairs.